The Village-Betrothal by Jean-Louis Greuze, Part 8 of the Introduction to Art and Artists of Our Time. From the picture by Jean-Louis Greuze. "The Village-Betrothal" - "L'Accordee du Village" - was sent to the Salon of 1761, where it was called in the Catalogue "A marriage-scene; at the moment when the father of the bride gives the dowry to his son-in-law." It was painted for M. Randon de Boisset, who sold it to the Marquis de Marigny for 9,000 francs. In 1782, when the collection of the Marquis was dispersed, this picture was purchased for the collection of the King for 16,650 francs, and is now in the Louvre. Our engraving gives a very good notion of the picture as a composition, and Greuze's coloring was so poor, with its fatal predominance of gray and lilac tones, that it loses nothing by translating into black and white. The personages of the little drama are grouped in the cottage of a well-to-do peasant. At the right, a half-opened cupboard shows an array of dishes and other utensils with a comfortable bottle of wine, and on a large shelf fixed against the wall is ranged a row of big loaves of bread, the supply of a week at least. On the rack below the shelf is a gun, and a lantern hanging by with a string of tallow-candles. In front of the cupboard is a table; on one side sits the father, and on the other the notary in an official cocked-hat and a loose coat, with the betrothal-papers before him ready for signing. The father of the bride, a venerable old man with a head a la Franklin, has just put the purse into the hand of his son-in-law, and holding out his arms, seems to invite his daughter to a last embrace. 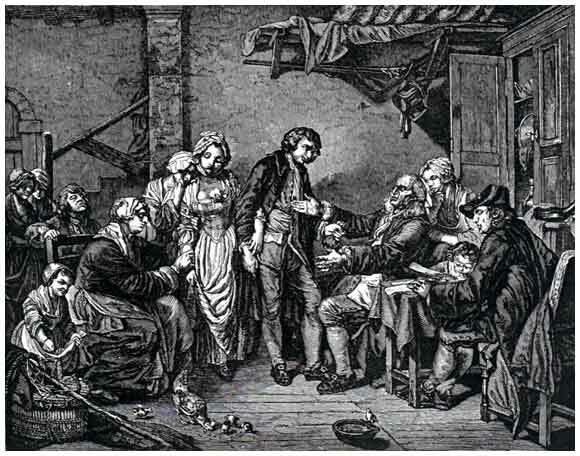 Behind the old man is a young girl who looks on at the scene, nursing her chin with her hand, and a little child pushing in by his father's chair, tries to play with the notary's papers. The son-in-law, a limp, loosely made, soft lout of a fellow, little more than a boy, stands in front of the old man, holding the purse in one hand and looking into nothingness with a vapid smile. The daughter, a simpering, tearful creature, is half hid from her father by her young husband, but is made, as the title of the picture demands, the centre of the composition. She has passed one arm under that of the young man, who pays no attention to her whatever, making no movement to return the pressure of her hand as it lightly rests on his. Her younger sister weeps on her shoulder, and her mother, full of tears also, grasps her other arm and hand, as loath to let her go. In the background are two or three persons, figure-heads apparently, who seem to have no other excuse for being but that they fill up a gap, while the skirts of another person are seen disappearing up the stairs. In the foreground a child is feeding a hen with grain from her apron; a brood of freshly hatched chicks are sharing the meal with their mother, and one of them drinks from a dish of water placed on the floor. The picture is full from end to end of soft, maudlin sentimentality. All the people seem melting away; their limbs hang loose, their garments hang as loosely; their hands are nerveless, their faces look as if they were ready to burst into tears at a word. They are all posing. No one is really doing anything. To whom is this father holding out his hands? Whom is the notary addressing? At whom is the mother looking? And the drawing answers to this moral flabbiness. It is careless beyond what can be allowed; but it is characteristic of all Greuze's work in its want of force - the result of want of insight.